On behalf of our Director of Bands, Professor James Holden, Jr. and the entire Trojan Explosion family, I extend Greetings from the Land of Troy. 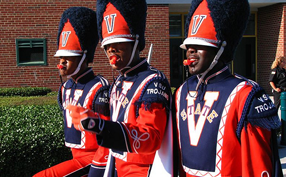 Instrumentalists, flags, twirlers, dancers, we would love to have you join the VSU Trojan Explosion Marching Band. All freshmen are paired with an upperclassman by major for study sessions held in the library. Band members are provided with a custom VSU warm-up suit for travel, VSU band t-shirt, VSU cap, VSU winter hat, black marching shoes, blue Nike sneakers for travel. Each member will be assigned a marching band uniform set for home and away, cost for uniform cleaning is handled by the Marching Band, not students. All travel charges are included at no cost to students which includes hotel, meals, charter buses with electric outlets and Wi-Fi to ensure students can focus on academics while traveling. Registration will take place from 9:00 – 11:00 a.m. During this period you will check in at Davis Hall, pay your band dues (cash or check), be issued a locker and most importantly move into your assigned residence hall. VSU will only provide housing for students who will be residing on campus throughout the academic year; you should receive your housing assignment prior to band camp. We have allotted ample time for students to move in, clean, have lunch on your own, visit the local stores and any other things that you may need to do before coming together to meet with staff. Incoming members residing off campus, including Bland or a VCCS campus (Reynolds and Tyler) during the academic year will report for registration at 2:00 p.m. at Davis Hall. Everyone will report to the band room on the ground floor of Davis Hall for a meeting with students and family at 3:00 p.m., during this period you will be introduced to staff members and we will go over the specifics of band camp. After this, family members may depart and we will have dinner at Jones Dining Hall, the cost for band camp participants will be covered. After dinner we will begin rehearsal, attire for band camp and practice throughout the year will be navy blue bottoms (no jeans) and plain white t-shirts, please bring enough attire to last at least throughout the week. Unless you also play an instrument, any person trying out for an auxiliary group (Dancers, Twirlers, and Flags) that does not make the squad will have to follow the freshman week schedule with all incoming freshman that are not participating in the band. If you have any questions, please contact me at mbjones@vsu.edu or 804-524-3697.